BEIJING - The Olympic torch ended its months-long global relay on Friday noon at the Beijing Olympic Youth Camp, about eight hours prior to the opening of the Games at the National Stadium. 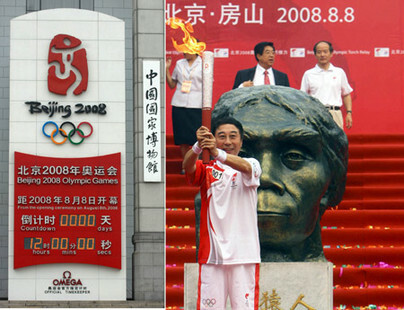 At around 12:20 p.m., Xu Zhihong, the Peking University president and final torchbearer of the three-day Beijing relay, carried the torch and lit the cauldron at the camp. "Putting the youth camp as the final section of Beijing's torch relay is of great significance. The future world belongs to the youth," he said. The Olympic Youth Camp, opened on Wednesday, was situated at the Beijing No. 101 Middle School. It gathered about 480 campers from five continents, including 10 handicapped campers. The campers will watch the Games' opening ceremony and some competitions, tour around the city and take part in camp activities. "We have been preparing to host the Beijing Games for seven years, and eventually it is about to open. I hope all young people to make joint efforts and contribute to the successful hosting of the Olympics," Xu added. With it, the relay in this host city came to an end. After being lit at the birthplace of the Olympic Games in Olympia, Greece, on March 24, the torch traveled to Beijing on March 31 for a ceremonial start of its global trip. Under the theme "Journey of Harmony," the relay took the torch 137,000 km through six continents over 129 days, passing through 21 cities, including Hong Kong and Macao, before touring China's mainland starting May 4. On the mainland, the Olympic flame traveled to 30 provinces, municipalities and autonomous regions before it arrived in Beijing on August 5. During the run, the torch was relayed on May 8 on Mount Qomolangma (Everest), the world's highest peak, for the first time in history. After the conclusion of Friday's relay, the flame was handed over to the Games' opening ceremony group and would be used to light the cauldron at the opening ceremony of the Beijing Olympics. Friday's relay started at Zhoukoudian, a UNESCO heritage site in southwestern Beijing suburb that has yielded many archaeological discoveries. Amid loud music and cheers, the first torchbearer, Feng Gong, one of the top Chinese comedians, carried the torch and started running at around 7:05 a.m..
Zhoukoudian in Fangshan District, about 48 km southwest of downtown Beijing. became famous as the discovery site of Peking Man, one of the first specimens of Homo erectus. The Peking Man skull fossil dates back 200,000 years to 700,000 years. "As the first torchbearer at Zhoukoudian, it is an honor for my whole life," Feng told Xinhua after his stretch. "Though I just ran for 70 to 80 meters, it seemed to me that I have passed through the tunnel of time and space." "From primitive stone tools used by prehistoric humans to the 'Bird's Nest' and the 'Water Cube,' human civilization has been passed down from generation to generation, just like the Olympic torch relay," said the 51-year-old performer, referring to the National Stadium and the National Aquatics Center. Following him, nine others carried the torch and ran in turn to finish the 652-meter section within this archaeological-site-turned park. It took them about 10 minutes. Leaving the park, the Olympic torch advanced for Mentougou District, north of Fangshan. In total, 140 torchbearers ran on the 7.9 km route in the final day of relay. During the last three days, 841 torchbearers took part in the 38.9 km Beijing route. On the first day, the torch started from the landmark Forbidden City in the city center. After passing other landmarks, including Tian'anmen Square, the egg-shaped National Center for the Performing Arts and Qianmen, it ended at the Temple of Heaven (Tian Tan in Chinese). On Thursday, the flame began its relay with a historic run on the Great Wall. It ended at the Temple of Earth (Di Tan in Chinese) in the afternoon.